Dredging through Newsnow and the newspapers it seems that there is a strong likelihood that the Brazilian is coming. Paulista is not in the Villarreal squad which is a good sign. Apparently so is Kevin Grosskreutz from Borussia Dortmund. A 26 y.o. defender who can play any position across the back-line and is available for €5m which in today’s insane transfer fees is just a pile of M & M’s. Let’s assume both these chaps arrive, what then? What about the development of Calum Chambers who hasn’t played for months and needs games to fulfil his undoubted potential? What of BFG? Is he to be a bench-warmer? I know the man is creaking but who wouldn’t after having played virtually every minute of the season. Merts is not ready for his free bus-pass – the man is only just 30 and has at least 3 good years in him. Can we buy on Ebay? I have bought over 300 items from Ebay and have a 100% rating, granted throughout those 300 items I have been disappointed with one or two items. Buying things from photo’s and a short description, can leave you exposed to the odd dodgy item but read the description and many times you read in them what you want to read, only when you log back in and read it all over again you can often find something you missed. I have always bought, but I have just entered an item for sale, a set of alloy wheels, and the amount of questions i have been asked has surprised me.I know we send scouts out to watch certain players, and yes a player may look good on the field. But what about his personality his sexual persuasion or even his record, sickness discipline or even a police record, surely for the amount of money paid out you would expect a 4 page dossier, but we have still signed injured players. Now I read that we have added 8 year old kids to our academy, even Beckham’s boy has come and played a bit and i have to ask myself what’s the point. Young kids who don’t even know what its all about, being propositioned by scouts agents or even parents, lets face it they are kids who still have a lot of growing up to do before you start nurturing, a talent that may never come to anything. Now when have we ever found a talent in the lower divisions, there are plenty who play, and when we play some of them in the cups we see guys who look as good as some of our multi million players, but no we spend millions on a 17 year old kid who plays in a foreign league who most of us have never heard of. Now with all of the holding midfielders and central defenders in the lower leagues who are all used to English football surely some of them are good enough to play in the premier, but how often do we even look. If we search the world for 8 year old maybe’s, and hope they grow to six feet 2 or 3 and will be strong enough to play top flight football who are we trying to kid. A few seasons back when we were struggling we could have bought Cahill or Samba and we never, we buy Squilachy instead I don’t think the right questions were asked then, do you. I feel we have to buy players who have a bit of a track record, a player who is six feet 2 or 3 already players who have shown they are resistant to playing in rain sleet and snow, players who have a bit of fight in their bellies, and leave the Chamakhs and Eduardos Gervinhos to other teams. We have in our fold Wilshere Walcott Ramsey Diaby Gibbs who seem to spend most time injured, fairly good players who have shown when fit are decent talented footballers, but when these players are injured the team seems to struggle, so what do we do. Maybe like Ebay we should ask more questions, ask them early in the window so when an answer comes back that casts a doubt we can scroll through the others on the list. Research, and lots of questions before we part with our Wonga. Is Theo Worth his Wages? 9 years ago yesterday, a 16 year old born in Stanmore, North London was signed by Mr. Wenger. His arrival aroused much excitement because this kid was meant to be the best attacking prospect in the land. His name? 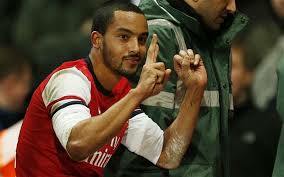 Theo Walcott. He was so good as a young boy that he was sponsored by Nike at the age of 14 and much to his credit refused an opportunity to join Chelsea. Joining Southampton Theo was the youngest player in S’ton’s long history to make a debut in the first team – he was just 16 and 3 months. Scoring a goal in his first starting game and playing with such verve that he became one of the BBC Young Sports Personalities of 2005 (winning it in his first AFC season ). Walcott signed for us in Jan 2006 whilst still a 16. y.o for ￡9m. I was excited – I bet you were excited. He took the 14 shirt which shows just how confident a young man he is. How do we assess his time at Arsenal? Do you think he is worth the hype and the huge wages? Let us start with the number of games he has played – almost 200 in a 9 year spell = 22 a season. Not good. From the season out with the shoulder injuries to last years knee-knack Theo has spent much time in the massive AFC treatment mansion. Yet when fit he is a potent attacking weapon and a man whose defensive abilities are under-estimated. But is my assessment skewed by my liking the fellow? Would we be better off selling him for a bucketload of money in summer rather than go through another tortuous contract negotiation? A goal every 5 games is not a particularly good return for someone who creates and is given so many scoring opportunities, yet in my opinion his absence cost us the title last season – we had no-one who could scare the opposition; a situation AW recognised and remedied with the purchase of Alexis. The fans love him as witnessed by the reaction when he warms up prior to coming on as sub. Which brings us to the nub of this post …. Is Theo still an automatic starter in our best first eleven? Given the wealth of attacking talent we have and the development of The Ox where does Theo fit in? Do we drop the magical Santi or the mercurial Alexis? We have two target men which indicates that either Welbz or OG will always start centrally. Rasp has been writing about a player having “their time” (re:Coq) and perhaps Walcott has missed his. I cannot see him as anything but a super-sub who will start perhaps one in three games. Is that enough for a man who is an automatic pick for England and has such a high media profile? Following on from yesterday’s topic, it seems an unwritten rule in football that the higher up the pitch you play, the greater the price tag. This is a generalisation of course, but it is an undeniable fact. Strikers command the highest prices and goalkeepers seem ludicrously cheap when you consider they have it every bit as much within their power to win or lose a game for the team. Well the answer has to be that it is 90% down to commercial considerations. Strikers are the glamour boys of football. They score goals, they put bums on seats, they sell shirts, they recruit new supporters who will spend money with the clubs, they appear in advertising campaigns …. everyone loves a striker. In short, strikers create revenue for the clubs, it’s market forces. Furthermore, it is easier to gauge a strikers abilities by the simple goals/game ratio, whereas a centreback for instance has no such definitive data on which to judge them. There is even a subtle difference between the relative values of an attacking midfielder in relation to a holding midfielder. Admittedly there is now a plethora of statistical information available for the geeks and statos among us to analyse the performance of players in all positions (no offence intended GN5 🙂 ), but as we have agreed many times on here, stats can be used to prove anything you want – or sometimes the opposite of what you want! In any case, which is the sexier, a player who smashes the ball into the back of the net or a defender who wins a header? Some supporters are exceptions, like those who have played the game (even if over the park) who will have an appreciation of the skills of a player who occupies the same position on the pitch as they once did, but most people these days watch football from the comfort of their sofa. We are a generation of fake football managers, experts on everything and nothing …. and yet as a collective, we wield more power than we imagine when it comes to the price tag attached to players. Obviously specific criteria are important in different positions on the pitch. The most obvious being height in defence, speed on the wings, vision and work rate in the midfield, trickery up front etc etc. Beyond that, there are fundamental considerations for all player purchases that combine to reach a price tag – and then add 20% on top for the agent! I thought it might be timely in this January window period to examine what these criteria are, and why they affect the player’s value. This would be my list in order of the effect they have on player value in the current transfer market ….. I would argue that points 1,3,5 and 7 are influenced by fan power. It is you who makes the strikers so expensive … just because you aren’t sophisticated enough in your appreciation of football to value a defensive midfielder. You’re so shallow you have to have pretty boys wearing your shirts. You feel deprived if your club doesn’t spend every penny of its transfer budget on shiny new players every window and what’s more, you want a German in defence, a Spaniard in midfield, a flying Dutchman on the wings and a South American magician up front. Footballers are overpriced and overpaid because we, the supporters, idolise them. We give them their value and the money men take their lead from us. So is there anything we can do about it? Yes, we can just stop loving them for their flair, brilliance, athleticism, fabulous goals and crunching tackles, the way they love only our club (not!) ……. OK, maybe we can’t do those things. You may wish to disagree with my list of criteria, or to rearrange the order of precedence, or just insult me for being ‘an armchair expert’. Feel free to steer the debate in whichever direction you desire – just remember, it’s not the fault of the new young generation – it’s all your fault. The Window is Open …. Do You Predict a Draft or a Draught? Though the victory against City has quietened a lot of the speculation, with the transfer window still open, Arsenal continue to be linked with players in virtually every position. For GK, the media insists Szczesny’s time is over at Arsenal and we’re looking at Italian ‘next Buffon’ (I forgot his name) as his replacement. At CB there are rumours of Paulista (confirmed by the player), Moreno, Otamendi, or Winston Reid. The Loic Perrin rumour seems to have died a natural death. In midfield there’s Gundogan, Schneiderlin, Carvalho, Sissoko (he’s not a DM), Brozovic (an AM) and Atletico Madrid’s Suarez. Oddly enough, we are also being linked with strikers like Dybala, Destro (COOOOBbbbraaaaaa!!) and Micky’s man crush, Cavani. I shall ignore the Falcao rumour. That’s all good fun, but what will that mean for some of our current squad? Who we buy now also affects our plans for the next season and beyond. Are we ready to make a final decision on the likes of Campbell, Sanogo and Akpom and get in someone else? Is there room for all of them? What about Gnabry? In midfield there is now Coquelin who, if nothing else, has reduced the need to buy ‘someone, just anyone’. With Flamini and Diaby likely on their way out, and Arteta and Rosicky on their last legs there is potentially space to buy here. Hopefully players like Maitland-Niles, Zelalem, Crowley etc will still get their chance to impress, along with Bielik of course, if he signs. In defense we could definitely do with a signing, and since Mertesacker and Koscielny are now both around 29, the likes of Hayden and Ajayi should eventually get their chance if they keep improving. But what of Jenkinson? Bellerin showed great promise against ManCity, but Jenkinson has been doing well at West Ham, and is a genuine gooner. Can we make space for him in the squad next season? That would mean 23 players registered. Sanogo and Jenkinson, if included, would have to be registered too. Which would make 25. Do we need them? Considering that I’ve already accounted for a new signing in defense and midfield each, do we need anyone else, maybe in attack? Pretend you are a manager and that you know what you are talking about and discuss. Here are a few AAers’ comments…………………. Big performance from Le Coq as well. Wasn’t it Gary Neville who said after the Stoke win that if we went up against City relying on the likes of Bellerin and Coquelin we’d be in big trouble? Well, sorry Gary, you may be flavour of the month when it comes to football punditry, but you got that one wrong. “Remember at the beginning of the season when we looked at the squad with its shiny new signings and thought — wow! That excitement has dimmed by the fact that it has taken and still is taking a lot longer for that squad to gel to the potential that we all expected. We are capable of fielding a team every bit as good if not better than City and they are under far more pressure than we are. We witnessed a veritable miracle today. Mike Dean actually awarding Arsenal a penalty. Who would have thunk it? Except Raddy under the influence of some psychotropics obviously. That obviously helped us, and we were very very good almost throughout. Cazorla definitely Motm, and I loved the vine of him dancing after Groud scored. All 4 defenders did well too, ably protected by Coquelin, who now that he is playing well, will inevitably run off at the end of the season by running down his contract. He still has some way to go in improving his passing and vision, but he can still learn. I hope he’s given an extension. Sanchez and Ox’s dribbles didn’t really come off as usual, but there was no lack of effort from them, and Giroud as well. As you can see, I think everyone did well, and it feels good to be able to say that. We were absolutely fantastic for the whole 90 minutes. Reminded me of the Dortmund game at the Ems where we defended as a unit and broke at pace. That first goal is so important to how we play and once again it showed. Cazorla was quality again and Sanchez never stops. The 4 at the back were excellent as well.